E-Learning is a great option for businesses that have multiple therapists to train. Learning via the web is the most economical option as it allows staff members to study at their own pace without missing work. Having a Certified DeepFeet Therapist on site to mentor your staff while they are learning is ideal, however, we also offer virtual and in person support with a Certified DeepFeet Instructor. Our Ashiatsu E-Learning course was structured with the same quality and care we provide in a live classroom setting. We’re here to help students understand every element of Ashiatsu and barefoot massage so they can incorporate the best techniques into their practice while learning from the comfort of their home or office. Techniques taught are western focused and include cross-fiber friction, effleurage, petrissage, compression as well as trigger point and myofascial techniques. Client and therapist safety is our number one priority which is why we have designed Pro Level E-Learning series with video feedback, reviews and online or live certification with an authorized DeepFeet Instructor. 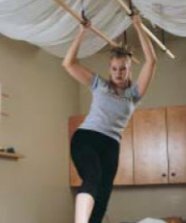 This is our most economical training program which is ideal for therapists that have an on-site mentor who is already trained and certified in Ashiatsu DeepFeet Bar Therapy. Those mentors can help guide and support therapists through the learning process. It’s also a great starter package with add-on support available. Step it up a notch! This program is ideal for therapists wanting to learn more and fine tune their Ashiatsu skillset. Our Deluxe Package includes everything in the Intro Package plus a Performance Video Review. 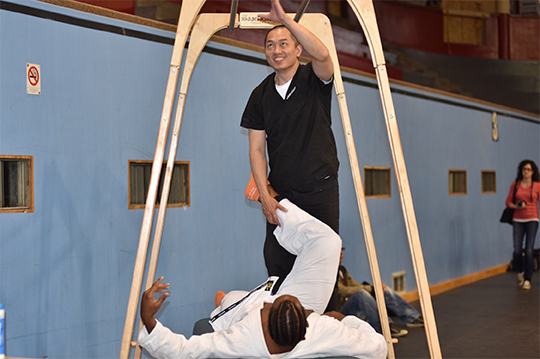 Students are assigned a Certified DeepFeet Instructor that works one-on-one with the student to provide constructive feedback on body mechanics and stroke application via video submission and phone meetings. Once video submissions have been reviewed and the student has passed, a final bar exam will take place in an online video session with a Certified DeepFeet Instructor. This is a one-on-one, customized exam to work with the practitioner and their skillset. Once the course and final exam are completed, the student will become a Certified DeepFeet Practitioner. Includes lifetime online directly listing and certificate of achievement. Live Certification with a DeepFeet Instructor available instead of an online session is available. See additional offerings below. 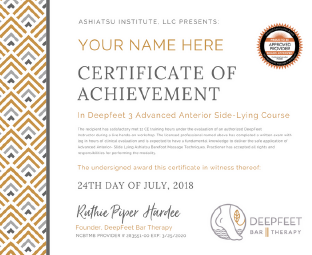 * Being Certified by DeepFeet Bar Therapy will allow for more protection when it comes to liability and also assures that your therapists are working safely and at their best potential. This is not a typical home study massage course that only involves a written manual and video instruction. Our course meets the standards of a true E-Learning experience where students will log into a private, secure online platform. They follow a detailed course outline, and are tested on each lesson before they are able to move onto the following module. Most students will spend approximately 3-4 hours on the lecture portion of each class before viewing the Ashiatsu Video Instruction. Our primary goal is safety for both the therapist and the client. 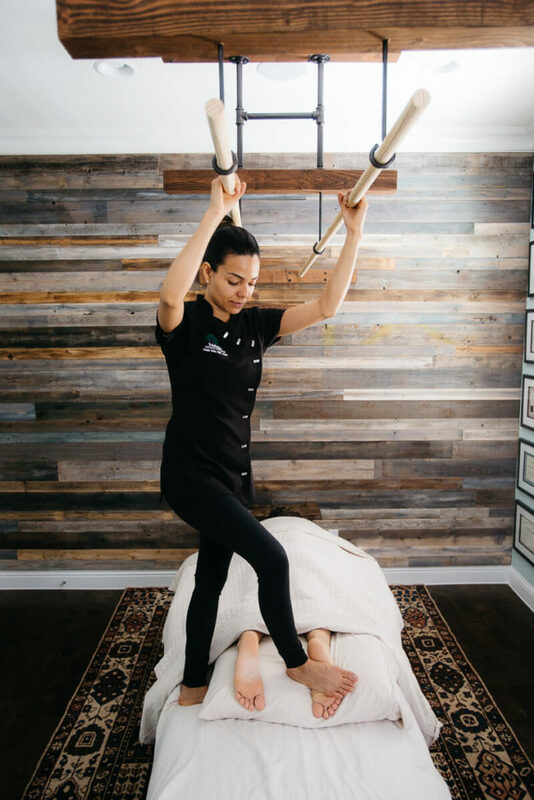 Making sure you have an understanding of proper bar construction, contraindications, and body mechanics is key to delivering a safe and productive Ashiatsu treatment. Documented practice sessions are required to complete our E-Learning courses and receive full CE credit. What sets our E-Learning Course apart from others is that our content is delivered in a fashion that is interesting, challenging and most importantly holds students accountable for learning and retaining the content so that you can practice Ashiatsu effectively and successfully beyond your time with us. 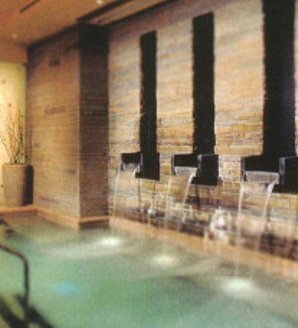 We offer three comprehensive packages to choose from that were designed to suit your individual needs. All packages provided will prepare you to offer Ashiatsu as a service in your practice. However, in order to market yourself as a DeepFeet Certified Therapist you must complete the Pro Certification Course. If you have multiple therapists you would like trained please email us for more info. On-Site Live Training: We schedule a 3-day class at your location and send a Certified DeepFeet Instructor to train your staff members in person. Six therapist minimum, travel and lodging included. Email info@deepfeet.com for a custom quote. On-Site Certification Live Proctor Class: After all enrolled therapists complete the E-Learning Course, a Certified DeepFeet Instructor travels onsite to perform a one day review with students. $225 per student 6 person minimum. This option would be an add-on to the Deluxe E-Learning Course. Off-Site Certification Live Proctor Class: After all enrolled therapists complete the E-Learning Course, students travel to an Authorized DeepFeet Training Location to attend one day review with Certified DeepFeet Instructor. $150 per student, 4 student minimum. This option would be an add-on to the Deluxe E-Learning Course. Tutoring: Hourly live or online tutoring available for $75.00 per hour. 2 hours of bar installation consulting. Would You Pay Someone to Walk on You?